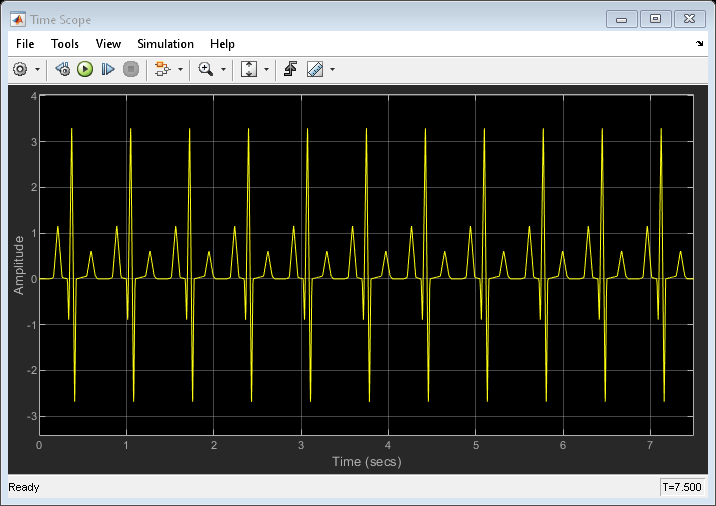 The Simulink® Scope block and DSP System Toolbox™ Time Scope block display time domain signals. The two blocks have identical functionality, but different default settings. The Time Scope is optimized for discrete time processing. The Scope is optimized for general time-domain simulation. For a side-by-side comparison, see Simulink Scope Versus DSP System Toolbox Time Scope (Simulink). You must have a Simscape™ or DSP System Toolbox license to use the Peak Finder, Bilevel Measurements, and Signal Statistics. 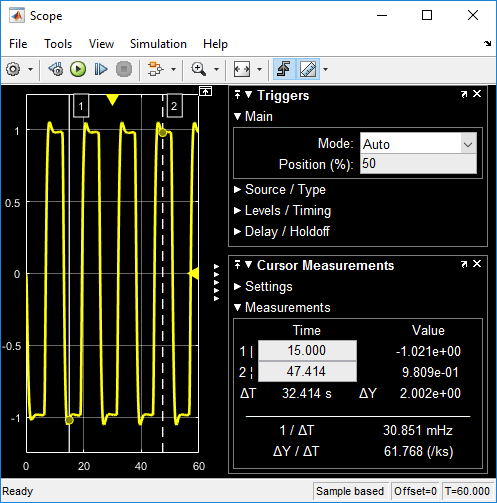 Simulation control — Debug models from a Scope window using Run, Step Forward, and Step Backward toolbar buttons. Axis autoscaling — Autoscale axes during or at the end of a simulation. Margins are drawn at the top and bottom of the axes. 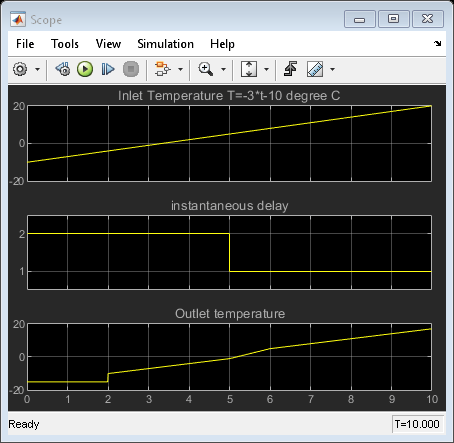 Display data after simulation — Scope data is saved during a simulation. 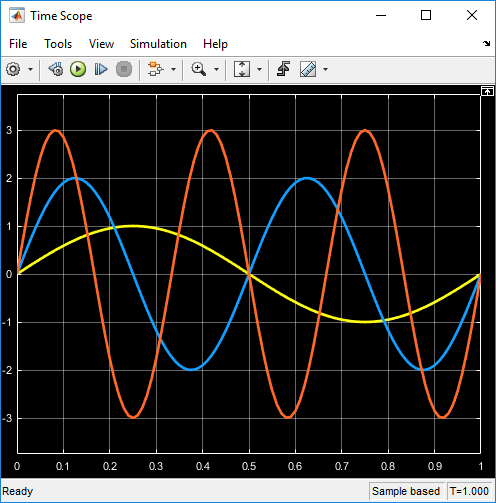 If a scope is closed at the start of a simulation, when you open the scope after a simulation, the scope displays simulation results for attached input signals. If you have a high sample rate or long simulation time, you may run into issues with memory or system performance because the scope saves data internally. To limit the amount of data saved for scope visualization, use the Limit data points to last property. For information on controlling a scope programmatically, see Control Scope Blocks Programmatically (Simulink). Do not use scope blocks in a Library. If you place a scope block inside a library block with a locked link or in a locked library, Simulink displays an error when trying to open the scope window. To display internal data from a library block, add an output port to the library block, and then connect the port to a Scope block in your model. If you step through a model, the scope only updates when the scope block runs. This means that the time shown in the status bar may not match the model time. When connected to a constant signal, a scope block may plot a single point. The scope shows gaps in the display when the signal value is NaN. When you visualize multiple frame-based signals in the scope, some samples of signals with a frame size of 1 might not be displayed. To visualize these signals, move the signals with frame size of 1 to a separate scope. Type — Continuous (sample-based) or discrete (sample-based and frame-based). Data type — Any data type that Simulink supports. See Data Types Supported by Simulink (Simulink). Dimension — Scalar, one dimensional (vector), two dimensional (matrix), or multidimensional (array). Display multiple channels within one signal depending on the dimension. See Signal Dimensions (Simulink) and Determine Output Signal Dimensions (Simulink). When the input is a constant signal, the scope block plots a single point. You can connect nonvirtual bus and arrays of bus signals to a scope block. To display the bus signals, use normal or accelerator simulation mode. The scope block displays each bus element signal in the order the elements appear in the bus, from the top to the bottom. Nested bus elements are flattened. To log nonvirtual bus signals with a scope block, set the Save format block parameter to Dataset. You can use any Save format to log virtual bus signals. The Configuration Properties dialog box controls various properties about the scope displays. From the scope menu, select View > Configuration Properties. Select this check box to open the scope window when simulation starts. Select this check box to display the block path in addition to the block name. Specify number of input ports on a Scope block, specified as an integer. The maximum number of input ports is 96. Specify number and arrangement of displays. The maximum layout is 16 rows by 16 columns. To expand the layout grid beyond 4 by 4, click within the dialog box and drag. Maximum of 16 rows by 16 columns. If the number of displays is equal to the number of ports, signals from each port appear on separate displays. If the number of displays is less than the number of ports, signals from additional ports appear on the last display. For layouts with multiple columns and rows, ports are mapped down then across. Specify the time interval between updates of the scope display. This property does not apply to floating scopes and scope viewers. Elements as channels (sample based) - Process each element as a unique sample. Columns as channels (frame based) - Process signal values in a channel as a group of values from multiple time intervals. Frame-based processing is available only with discrete input signals. Auto - If Title and Y-label properties are not specified, maximize all plots. On - Maximize all plots. Values in Title and Y-label are hidden. Off - Do not maximize plots. Auto — Difference between the simulation start and stop times. The block calculates the beginning and end times of the time range using the Time display offset and Time span properties. For example, if you set the Time display offset to 10 and the Time span to 20, the scope sets the time range from 10 to 30. User defined — Enter any value less than the total simulation time. Specify how to display data beyond the visible x-axis range. Wrap — Draw a full screen of data from left to right, clear the screen, and then restart drawing the data from the left. Scroll — Move data to the left as new data is drawn on the right. This mode is graphically intensive and can affect run-time performance. Metric — Display time units based on the length of Time span. Seconds — Display time in seconds. None — Do not display time units. Offset the x-axis by a specified time value, specified as a real number or vector of real numbers. Scalar — Offset all channels of an input signal by the same time value. All — Display x-axis labels on all y-axes. None — Do not display labels. Selecting None also clears the Show time-axis label check box. Bottom displays only — Display x-axis label on the bottom y-axis. Show time-axis label to on. The Active display property determines which display is affected. To enable this property, set Time-axis labels to All or Bottom Displays Only. Selected display. Use this property to control which display is changed when changing style properties and axes-specific properties. Specify the desired display using a positive integer that corresponds to the column-wise placement index. For layouts with multiple columns and rows, display numbers are mapped down and then across. Title for a display. The default value %<SignalLabel> uses the input signal name for the title. Toggle signal legend. The names listed in the legend are the signal names from the model. For signals with multiple channels, a channel index is appended after the signal name. Continuous signals have straight lines before their names, and discrete signals have step-shaped lines. From the legend, you can control which signals are visible. This control is equivalent to changing the visibility in the Style properties. In the scope legend, click a signal name to hide the signal in the scope. To show the signal, click the signal name again. To show only one signal, right-click the signal name, which hides all other signals. To show all signals, press Esc. The legend only shows the first 20 signals. Any additional signals cannot be controlled from the legend. Select this check box to show grid lines. On — Display magnitude and phase plots. If the signal is real, plots the absolute value of the signal for the magnitude. The phase is 0 degrees for positive values and 180 degrees for negative values. This feature is useful for complex-valued input signals. If the input is a real-valued signal, selecting this check box returns the absolute value of the signal for the magnitude. Off — Display signal plot. If the signal is complex, plots the real and imaginary parts on the same y-axis. Specify the minimum value of the y-axis as a real number. If you select Plot signals as magnitude and phase, this property only applies to the magnitude plot. The y-axis limits of the phase plot are always [-180 180]. Specify the maximum value of the y-axis as a real number. Specify the text to display on the y-axis. To display signal units, add (%<SignalUnits>) to the label. At the beginning of a simulation, Simulink replaces (%SignalUnits) with the units associated with the signals. Example: For a velocity signal with units of m/s, enter Velocity (%<SignalUnits>). If you select Plot signals as magnitude and phase, this property does not apply. The y-axes are labeled Magnitude and Phase. Limit data saved by the scope internally. By default all data points are saved so that you can view the scope visualization after the simulation finishes. For simulations with Stop time set to inf, consider selecting Limit data points to last. If you do not select Limit data points to last and you have a high sample rate or long simulation time, you may run into issues with memory or system performance. When you select this property, the scope saves the latest n data points, where n the specified number of data points. Off — Save and plot all data values. On — Save specified number of data values for each signal. If the signal is frame-based, the number of buffered data values is the specified number of data values multiplied by the frame size. In some cases, selecting this parameter can have the effect of plotting signals for less than the entire time range of a simulation (for example if your sample time is small). If the scope plots a portion of your signals, consider increasing the number of data points to save. This property limits the data values plotted in the scope and the data values saved to a MATLAB® variable specified in Variable name. On — Plot and log (save) scope data every Nth data point, where N is the decimation factor entered in the text box. A value of 1 buffers all data values. Off — Save all scope data values. To enable this property, select Log data to workspace (Simulink). This property limits the data values plotted in the scope and the data values saved to a MATLAB variable specified in Variable name. Select this check box to enable logging and enable the Variable name, Save format, and Decimation properties. This property does not apply to floating scopes and scope viewers. For an example of saving signals to the MATLAB Workspace using a Scope block, see Save Simulation Data Using Floating Scope Block (Simulink). Specify a variable name for saving scope data in the MATLAB workspace. This property does not apply to floating scopes and scope viewers. Select variable format for saving data to the MATLAB workspace. This property does not apply to floating scopes and scope viewers. Dataset — Save data as a dataset object. Use the Dataset signal format configuration parameter to select the dataset object. This format does not support variable-size data, MAT-file logging, or external mode archiving. See Simulink.SimulationData.Dataset. Structure With Time — Save data as a structure with associated time information. Structure — Save data as a structure. Array — Save data as an array with associated time information. This format does not support variable-size data. The Axes Scaling dialog controls the axes limits of the scope. To open the Axes Scaling properties, in the scope menu, select Tools > Axes Scaling > Axes Scaling Properties. Manual — Manually scale the y-axis range with the Scale Y-axis Limits toolbar button. Auto — Scale the y-axis range during and after simulation. Selecting this option displays the Do not allow Y-axis limits to shrink check box. If you want the y-axis range to increase and decrease with the maximum value of a signal, set Axes scaling to Auto and clear the Do not allow Y-axis limits to shrink check box. After N Updates — Scale y-axis after the number of time steps specified in the Number of updates text box (10 by default). Scaling occurs only once during each run. Allow y-axis range limits to increase but not decrease during a simulation. To use this property, set Axes scaling to Auto. Set this property to delay auto scaling the y-axis. To use this property, set Axes scaling to After N Updates. On — Scale axes when simulation stops. Off — Scale axes continually. Specify the percentage of the y-axis range used for plotting data. If you set this property to 100, the plotted data uses the entire y-axis range. Specify where to align plotted data along the y-axis data range when Y-axis Data range is set to less than 100 percent. Top — Align signals with the maximum values of the y-axis range. Center — Center signals between the minimum and maximum values. Bottom — Align signals with the minimum values of the y-axis range. Scale x-axis range to fit all signal values. If Axes scaling is set to Auto, the data currently within the axes is scaled, not the entire signal in the data buffer. Specify the percentage of the x-axis range to plot data on. For example, if you set this property to 100, plotted data uses the entire x-axis range. Specify where to align plotted data along the x-axis data range when X-axis Data range is set to less than 100 percent. Top — Align signals with the maximum values of the x-axis range. Bottom — Align signals with the minimum values of the x-axis range. To open the Style dialog box, from the scope menu, select View > Style. Background color for the scope. When you select Auto, the plot type is a line graph for continuous signals, a stair-step graph for discrete signals, and a stem graph for Simulink message signals. Select the background color for axes (displays) with the first color palette. Select the grid and label color with the second color palette. Specify whether to use the displayed color of the scope when copying. When you select File > Copy to Clipboard, the software changes the color of the scope to be printer friendly (white background, visible lines). If you want to copy and paste the scope with the colors displayed, select this check box. Select active line for setting line style properties. Show or hide a signal on the plot. The values of Active display and Properties for line determine which line is affected. Select line style, width, and color. 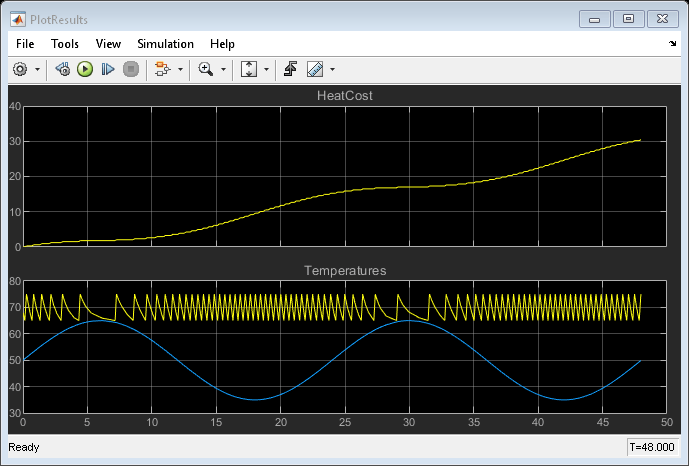 Use Simulink® to create the thermal model of a house. This system models the outdoor environment, the thermal characteristics of the house, and the house heating system. Two cases where you can use Simulink® to model variable transport delay phenomena. Use the Time Scope Peak Finder panel to measure the heart rate from an ECG. If you run your simulation for a long time, you may run into out-of-memory issues because the scope saves data. To limit the amount of data saved for scope visualization, use the Limit data points to last property. This block can be used for simulation visibility in system that generate code, but is not included in the generated code. This block can be used for simulation visibility in subsystems that generate HDL code, but is not included in the hardware implementation. This block accepts fixed-point input, but converts it to double for display.